I like to think Mythbusters has contributed postively to the kinds of players that love coming up with imaginary contraptions in roleplaying games. A bit of news: Firstly, I've removed the banner ad from the site. Those of us with AdBlock probably didn't notice, but it's gone now, as promised on Patreon. Also thanks to Patreon, the Fallout is Dragons podcast is now fully hosted on libsyn. This mainly serves two purposes: One, hosting the master files on Dropbox would have eventually run out of space, and two, we now have an RSS feed for those that like to keep track of the podcasts they follow with content aggregators. We'll still being putting videos on YouTube, naturally, and the Tumblr will continue to be the home for livestream announcements and all the supplemental content. All that's really changed is that our little amateur tabletop podcast now has a legitimate, centralized platform. CURSE YOU, SPUD! HOW DARE YOU MURDER BRUCE THE BANNER AD?! YOU SHALL SUFFER FOR THIS. MARK MY WORDS. Is... Is that a crack about the time hulk whipped out little hulk in public while screaming, "HULK STRONGEST THERE IS! ", or were you talking about something else? A panel from the issue in question. In truth, it wasn't until anything was said until I noticed it was gone (In life, my visual perception is like a 4, which is counterbalanced by every other one (and they have about a 12-16 on them)). I didn't notice the banner ad was gone either until it was mentioned in the author notes... which is funny, because coincidentally, I just got here from El Goonish Shive's website, and today's comic has to do with change blindness. Whoops! That was me. Didn't realize I wasn't logged in; this is the first time that's happened to me. I've tuned out ad banners to an art form. So I can understand Change blindness. The only kind of ad that still bothers me are videos that auto-play. Normally I'm cool about silent ads since some websites use it to offset site costs, but when videos auto-play, all bets are off. And the hilariously bad thing is the sites that have auto-play video ads are the same sites I go to to watch a video. So the sound of the content I want to hear is drowned out by some voice demanding I buy their acne cream. I rather miss it too, but I'm not about to rain on anyone else's parade. I just react poorly to change. And Digo - big, green Banner? Have you been reading Avengers Roll Initiative? If so, that makes 2 comics I like referenced in this individual thread... Speaking of which, props to J. Shadow of the relevant link. Haven't read Avengers Roll Initiative. My comment was inspired by a joke I saw from TV Tropes. Dunno if related, but it's possible. I doubt it, then. Just reminded me of it, since it's another campaign comic on ComicFury and it's currently introducing the Hulk's character build. Ahh the good old "I don't think you know what the pluses mean" joke, combined with the "don't bother complaining about x. "I'm not I was complaining abou Y!" gag. Now I want actual party cannon stats for the system. Wait. Dangit. This is 4e, I can't use open-ended effects that allow you to use your imagination. I want to laugh, but it's just too true for me. Oh, I dunno. I DM 4th, and I'd allow it. Maybe we were playing 4e all wrong, but that's generally not how my groups ever played 4e. We never had problems finding sufficient room to invent and imagine. I know it's a joke, and I chuckled, but it's a joke I've been hearing since the comic started, and I realized I've never really chimed in on it until now. Even if it's at risk of reviving the age old 3.5/Pathfinder/4e debates of three years ago. Yeah, this comic's also almost three years old, by the way. This coming Monday. I've DMed 4th before and I never really had any trouble coming up with my own stuff. I made my own monsters, my own effects, and made my own race even, they all seemed to work pretty well. The adventure I made I even designed a skill challenge around a particular island of a floating city getting hit by a colossal dragon falling and making the island tilt. It was a fun little adventure to design and run. Oh also forgot to log in. P.S. Congrats on 3rd year anniversary! I've yet to play 4e - when I started D&D, it just confused me, so I gave up until I found 3.5 - but thanks to this comic giving me a much better general idea of how it works, I'm very much looking forward to trying it someday. Seems like a system's flexibility really depends more on DM than the system itself. And DS nails it! Who you're playing with matters most! And different systems fit different aesthetics of play. 3.5/Pathfinder is about playing in a world, sandbox style to an extent. 4E focuses a lot more on the heroes' adventures and that they are IMPORTANT, especially with the tier system. It notes that the Heroic Tier (levels 1-10) should result in the heroes saving towns and cities from evil, but at Paragon (level 11-20) you should transition into the fate of nations, and even the world. By the time you hit Epic Tier (levels 21-30), you wind up with self resurecting Demi-Gods, Fey Lords that can travel back in time to rescue themselves, and tricksters whose powers literally let them affect what the DM rolls. At this point, they're fighting on a level most people in their world can't even comprehend, with Gods, Demon Princes, Primordials, and even Great Old Ones as final foes. Heck, one Epic final foe possibility is Atropus the Living World, a planet sized outsider from the Far Realm (think Cthulu Land). Yes, the PCs have to find a way to defeat a (literally) planet sized foe. Once you hit epic levels, this is doable. Happy Birthday! 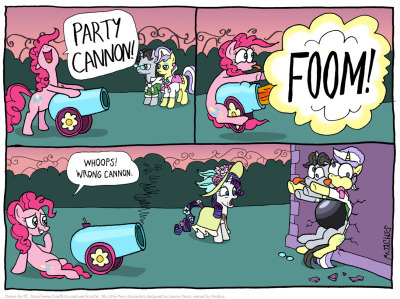 I've stated the party cannon! Daily: Grants a +8/12/16 bonus to diplomacy for ten minutes by creating an instant celebration, improving everyone's mood. If a celebration would not aid the situation, this bonus is not conferred and the use is waisted. Sweet! Time to bake all the cakes. Thanks for spending the time to make this comic, Spud. This is the kind of evil PC plotting that's behind why I never allow PCs to buy wish spells. When I've had players suggest a creation that poses staggeringly dangerous implications for the campaign, my first instinct is to try the "infeasibility" defense before outright shooting it down. The Infeasibility Defense is a good opening tactic. Just that my GM never bothered thinking about how dangerous some things could be in a campaign. Assuming you mean "at-will" as in standard action, it's not overpowered at all. You're giving up every other turn. Now, if you use the stupid "on use" definition out of the DMG where the spell triggers every time you swing the sword, then yeah, that's a problem. Sadly, it was the latter "on use" kind of at-will I meant. Thankfully that weapon got sundered later, but the can of worms was already opened. What Are Some Of The More Interesting Items You Have Crafted In Game? My Pathfinder character was going to be a Wand creator, but then things ended. My Toreador, however, have both created a host of things... One mostly has done dresses... For his Fall, or Winter Line. The other one was sort of a tech savvy guy who delved into a host of different things, computers, video goggles to mitigate the Toreador Clan Flaw, A pimped out pocketwatch... I might want to get back to him eventually. The Baterang: A Louisville slugger that returns like a boomerang. Does more damage thrown that it does swinging. Vest of Awesome: A bullet-resistant kevlar vest made for a unicorn (Trixie made this). Enchanted to give bonuses on Charisma tests. Chibi-Polaris: Theoretically, it was a scale model Polaris 3 nuclear missile with a micro-nuclear warhead to simulate an atomic blast. Advertised as capable of flattening half a city block. "Theoretical" because the other PCs refused to test this thing (It was built by my alien mechanic PC out of boredom one session). The Molotov Trixie: A molotov cocktail of gasoline and styrofoam stuffed into a Trixie doll. Light the rag (disguised as the tail) and throw. Trixie was not particularly happy when the party invented this. Less so when the molotov set a gas station ablaze. Long, long ago, in my first D&D group. Another player and myself were going to craft magical swords, both with spell reflection. We were then going to invent a tennis-like game where we tried to keep Magic Missiles in play for as long as possible. Much later, I had an Aquatic Elf who was an accomplished archer, sailor, and engineer. I tried to justify that he'd have enough knowledge of bows and rigging to create a compound bow. I'm not certain what advantage I thought I'd get out of that, but I just wanted him to have one. Then I had a half-orc Barbarian/Sorcerer. I was looking forward to him picking up Meteor Swarm, with a plan to mount the required metal tube onto a hand-crossbow frame. The bow portion, of course, would have been removed. The intention was to have a more natural angle when aiming, since Meteor Swarm required a to-hit roll. Add a holster to his hip and he'd be all set. The typical advantage of a compound bow is that you get to use both Strength and Dexterity bonuses with it: Dex to hit, Str to damage. (The only thing not in a MLP campaign) In a pathfinder game, I created a +10 headband of intelligence with psychic capabilities (mind reading, levitation of stuff, manipulation of someone's thinking), and I gave it to my raptor pet so I could have a good fighter. MLP game 5, team vs. team- I was the teams mechanic, and had to make an improvised vehicle to escape our (currently being demolished) land, So I used my Pinkie like abilities (seen it before + hammer space + grabbing stuff I should not have) add it to my double mind ability (CHANGLING! and a really thoughtful GM) and bang! Instant 10 pony rocket with active camouflage and party cannons for the rockets. It took a while for somepony to lead us back to civilization. MLP game 7 Post. War. Syndrome- war in equestrian/ other country, make weapons for war. Grab a boomerang, ask for a Luna blessing (Invisible) and nab a piece of Celestia's tail (run), combine to make a mini-nuke stealth bomb, give to a foal and tell them to go make a foreign friend (Lawful Evil had problems, I will admit). The coolest thing I made was for a 3.5 Steampunk campaign. I was playing a mechanic class that could make different components then combine them for different effects, like combining a pump and a pilot light for a flame thrower (yeah it was pretty cool). Though I found out you could combine these things onto regular items... So I began scheming as soon as I made my character. My goal: starting the game with a flying vehicle. I made this character which was kinda like a Steampunk greaser/biker who had an obsession with flight. My DM allowed me to craft things with starting money so I used every craft skill I had, which was a lot, to craft all of my items (including my clothes even) then used everything that was left over to make a super light motorcycle. Then I used almost every component I had to maximize for lift, and I carefully calculated everything to make sure all the components were as efficient as possible. In the end... I succeeded. I made my gyrocycle, which was capable of carrying me and almost all of my equipment at an incredible flight speed of 20' a round. The DM even agreed that if I had a little too much weight I could at least achieve a slow fall. I was so proud, It was the coolest thing I had ever made. Then I went to play... Turned out the DM decided to drop the campaign. I never got to play the character, I never got to ride my sweet gyrocycle... It was a dark day. I really wanna play this character some day... I miss my gyrocycle. I had a character who was a mage specializing in magical basket-weaving, although it covered all kinds of devices made out of woven plant material. In addition to 'friendship bracelets' (charm person as long as the target wears them) and the unfortunate incident where some foolish people put him in a cell with dangling tree-roots in the walls and he built a directional nuke to escape, he was the on in charge of building the party's transportation. It started as a giant airship, but got shot down so he rebuilt it as a smaller airship. Which got shot down and set on fire. He managed to save enough to build a pair of woven wings to fly what was essentially a boxcar around... which got shot down. One of the wings was salvageable as a magic carpet. Yes, it got shot down. I don't often make zany creations, but my Hobgoblin Barbarian I made for a party of... mixed alignment (2LG, 1NG, 1CN, 1LE, 1NE) had the background of being a ranger-ish hunter-gatherer, so when assigning skill points, I set some aside for Craft (Bowyer). Thanks to a lucky roll overseen by the DM, I got to start the game with a compound longbow with a STR rating of 3. Handy for his usual strategy of guerilla tactics in the early game, conserving Rage for when we got noticed and someone needed the meat shield... Later in the game, it would have been less useful, given that I wouldn't have much to invest in Stealth skills, but it was fun while the game lasted. The DM was fond of 2e, and oldschool enough that she had us start off fighting rats in a sewer. The look on her face as a Lawful Evil goblinoid barbarian snuck around sniping rats was priceless. I have one for you. I actually got the idea from reading the rules to F.A.T.A.L.. Terrible game, but there are some things that can be twisted into clever ideas. In this case, there was a jar that enchants men to impregnate it, and then a fetus grows in it. I turned that around, created these artificial womb jars, and marketed them in game as birthing aids. And then I did an evil thing. I created bottles with the same effect, but allowing the jar to halt fetal growth. Ship in a bottle? Hah! The big thing now is baby in a bottle! The intent was that the bottles could be used to store and transport fetuses, like for colonies and stuff. It was just a neat couple of magic items for uses. Honestly, though, the jars were a legitimate magic item. The bottle was just to see if he could. My wizard got rich off of them. And then I learned another, arguably more evil use. Man eaters were buying the jars by the hundreds, having slaves impregnate them, and then eating the contents. One use for the bottles was to treat the fetus like wine. They would stick a little blender arm thing into the bottle and turn the thing into a slurry. It was, naturally, a cause for much concern. My wizard argued that it keeps vampires and other evil creatures from preying on more productive members of society. The paladin argued that enabled and encouraged that evil to flourish, to eventually overrun the world. Thing is, all of this genuinely bothered the wizard, since, you know, he was trying to rationalize his products when they weren't evil, though baby wine is an unnecessarily horrible thing. Then again, keeping a living fetus in a bottle on your mantle really isn't what I would consider nice. Yeah, we were almost unanimously against the evil uses. Kusari-gama/double bladed scythe fit with an impact booster enchantment, to mimic Ruby Rose's use of HCSS bullets to speed up her slices. Theoretical: Revolver chambered crossbow, purely mechanical, with quick load bolt cartridges. I think you mean to say Blake Belladonna. Blake doesn't rely nearly as heavily on recoil as Ruby and Yang. Our Pathfinder Artifacer crafted as one of her Wonders (class features that let her mimic any spell of the appropriate level, not as broken as it sounds) the L.A.S.E.R. Light Amplified Scorching Emition Ray. It fired scorching ray as the spell. The running gag is that nobody agrees with her that it should be pronounced laser, but that it should be said la-ser, because there is nothing to make the A long form. "Maybe in common, but not in Elvish!" "But the acronym uses common words, not elven ones." "So? Are you saying I can't chose the language for my acronym?" "I'm just saying the languages should probably match." "Rikkan think la-ser sound better." "...no, no, don't waste shots, it's not worth it. You're an ambassador, play nice." The short version? I've built orbital laser platforms and railguns that can take out gods in a single shot. At mid-high levels in 3.x/Pathfinder. The orbital laser was a ritual/geometric magic construction focusing the power of a major ley line through a floating complex built in such a way that it absorbs ambient magic and channels it into a focus that can be imbued with a spell. Said focus had Scorching Ray imbued into it. If I recall correctly, the orbital laser was doing more D6 in damage than we had at the table. We mostly used it to cut holes in mountains, and only really ever used average damage. The railgun (well, technically a coilgun) was a stint with a DM who was a "if you can explain it, I'll let you do it" kind of DM. Through a lot of physics calculations, we figured out the amps and volts delivered with a Shocking Grasp, then ran that through a magically treated coil (of copper I think). Place a dagger in the "tube" and cast shocking grasp. Instant coil-gun. Capable of sniping dragons out of the sky from over a mile away. We were building a larger one to be powered by lightning bolts, and the campaign ended. I'm rather proud of the gnome all-the-polearms (a.k.a. Gygax's Delight.) Basically, gnomes took every kind of heavy and/or sharpened metal bit that has ever been put on the end of a long stick and stuck them all on the end of the same long stick. The end result is an exotic weapon that lets you choose whether you bludgeon, slash, or pierce... as long as you're proficient with it. Otherwise, the damage type is chosen at random as you flail about with this horrible idea made manifest. Thanks to weapon familiarity, all martially minded gnomes are trained in its use. ...good grief, how much would a monstrosity like that weigh?! Well, I'm currently working on skills and justification to create socketed magic armor and weapons capable of holding Ioun stones or gem-like wondrous items and providing their benefits through the weapon/armor. Once, we had an Erinyes in the party and his wings were red with black tips. My character kept plucking feathers when he wasn't looking, especially because they grew right back. So he yanked a whole pile of them out and finally put them together in an enormous Indian headdress that gave him social bonuses to Intimidate, diplomacy, and Bluff. That same campaign, there were crystals that grew with electricity and my character was a static generator with legs and great hair. He took as many chunks as he could and started making weapons, shields, houses, and everything else with his lightning spells. My characters make their careers around doing weird things, though the only one that made awesome stuff was a fire nation Airbender in a run based on Avatar:the last Airbender using the premise that as a result of the war every nation was starting to have off element benders. I'd made a geothermal power-station in a setting starting to discover steam power so that I could get the voltage needed to use electrolysis on salt water to keep my character stocked with airtight containers of highly toxic explosive gases for air-bending at/into my enemies. I'm sorry, DM, but you're wrong in this case. An item's bonuses don't necessarily have to be magical. Certainly, the + next to an item is generally implied to require magic, but if you read between the lines in the rules, you can have a +3 item where the + is purely mundane. well, there is the concern of any +6 item at level 7- i don't have hands on experience with those, but i'm under the impression +6 is really good, please correct me if i'm wrong. For a d20 system? Yeah. +6 is VERY good. However, given that this is an item whose usage is... minimal at best and the result of a very creative idea, I feel +6 is fine. I once had a +6 holy avenger lockpick. I didn't ask how or why. It was a +6 unbreakable lockpick. All I needed to know. Also grants +2d6 to the Open Lock/Disable Device or equivalent check when used against evil locks. Note that however disturbing a lock may look, or whoever may be using it, the lock has to be sapient to actually be evil. And, of course, not be of good or neutral alignment. ....and now I know how my next group of PCs will meet. If it's +6 to a skill then it's actually pretty weak. Although it should really be +5 to be a standard minor skill item. Not necessarily wrong. The DM could be referring to the pluses in terms of pricing. If that's the case, then an item equivalent to +6 is going to cost about 9 times what an item equivalent to +2 does. It also doubled as a shiv. It had a fancy wooden handle and everything. A paladin weapon designed for stabbing people in the back and getting into restricted areas. That just makes it even more hilarious. I found an alternate use for it. Turns out the head paladin's daughter was rather easily... unlocked. You should have seen the DM's face when I told him what I was using the handle of my +6 holy avenger for. He had drawn an image, and while it was a very nice drawing, the shape was more than a little suggestive. Sometimes I worry about you, Raxon.... Though given the jetbikes my Dark Heresy team looted today, I suppose I'm in no position to critique phallic equipment. Merely its use. I see no reason a Paladin can't be sneaky, if the cause is just. It's Knights that have to fight with honor; my paladins don't usually see much difference in methods if they absolutely must kill. The restriction on poison is irritating, but explainable. I get on at 9:30 in the morning to read the semi-daily comic, and I see that something has sparked a spike in comments? what the heck? I have not seen anything like that! Talk about unbelievable. And speaking about unbelievable, what is your thoughts on this matter, which is funny. I don't really do donations much since my economy can't afford it. but for those places I really really liked and would like to support I simply deactiavted adblock for and feel all generous. I understand, but the ads weren't helping by very much. Less than $50 USD a month, which meant I only saw a meager payout once every three months. Always too little, too late. As one of my milestones for the Patreon, I basically said to myself, "If this experiment does better than what Google Adsense is giving me 'per month,' then I'll switch over entirely. I'd just rather not deal with that frustration." Random crazy items for the party? We had one guy in our group who didn't have super high powered weapons, but a lot of random junk items always in the pack of his car. When ever a minor item was needed it was in the trunk since most of them were movie props including the clothes. Heck one game we got past a very difficult puzzle with a rock in a sock tied to a ball of yarn. Money wise very cheap and hardly worth making a note on. During that time it was very funny and a bit chaotic considering what happened. I beat this item will have a similar short lived but chaotic result. Then, when the party cannon was fired upon the attendants of the garden party, it was revealed they were changelings in disguise. This is how it went. ...Or was it like this?